Curious about a career in caring for animals? Veterinary technicians are a crucial part of the veterinary practice. So how does one become a veterinary technician? In order to become a registered vet tech, you’ll need formal schooling and a credential. 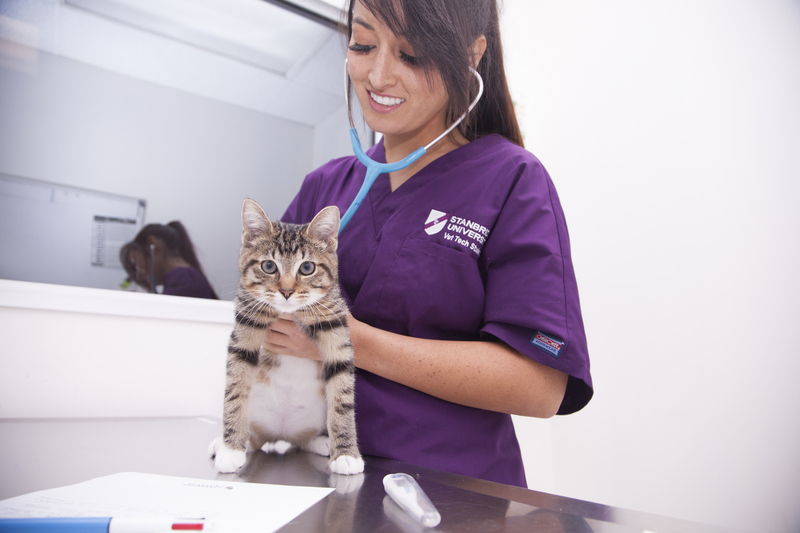 The majority of vet techs enter into the field by earning their associate’s degree. In these educational programs, students also get hands-on experiences in clinical facilities and internships. California has 18 veterinary technology programs accredited by the American Veterinary Medical Association’s Committee on Veterinary Technician Education and Activities (CVTEA). Every state regulates vet techs differently, but most require candidates to take a credentialing exam. In most states, the test that is used is the Veterinary Technician National Exam (VTNE). Vet techs must become certified, licensed, or registered in order to work as a vet tech, depending on the state. In California, candidates who pass the VTNE become Registered Veterinary Technicians (RVTs). The VTNE is a 4-hour, 200 multiple choice question certification exam. It is prepared exclusively by the American Association of Veterinary State Boards (AAVSB). You can take the exam at certain times of the year in your state. The exam covers seven major areas of study including pharmacology, surgical prep and assistance, dentistry, laboratory procedures, animal nursing, radiography, and anesthesia. Working under the direction and supervision of a licensed veterinarian, vet techs improve the health and wellness of dogs, cats, exotic pets, lab animals, farm animals, and zoo animals by assisting in their care and their medical procedures. To learn more about veterinary technicians, please visit www.bls.gov or www.navta.net. Learn about the Stanbridge University’s Veterinary Technician program, and apply to start your training to become a vet tech today. 1 American Association of Veterinary State Boards, Veterinary Technician National Exam, on the Internet at https://www.aavsb.org/vtneoverview (visited October 30, 2017). 3 Bureau of Labor Statistics, U.S. Department of Labor, Occupational Outlook Handbook, Veterinary Technologists and Technicians, on the Internet at https://www.bls.gov/ooh/healthcare/veterinary-technologists-and-technicians.htm (visited October 30, 2017).